Our Father in heaven Hallowed be Your Name ELAH Awesome Strong God Deut. 32:15 Thy Kingdom come. Thy will be done. On earth as it is in Heaven. We declare over our Parliament, over the EU and over all those involved in Brexit negotiations; the Lord God, is the Master Planner of heaven and earth. His plans are for good and not for evil, greater than every plan of man or the enemy to bring confusion, division or hopelessness. We come into agreement with His word, He is “The God who gives life to the dead and calls into being that which does not exist”. We stand as Your Ecclesia and in the Name of Jesus we call forth the strategies of heaven over all matters concerning Brexit. We declare they will be seen, heard, endorsed and enacted by those called to policy making at this time. Romans 4:17 Amp. In the Name of Jesus, we decree and declare the policies, treaties and concessions agreed between the UK Government and the EU negotiating teams, will be legislated according to Heaven, and bring convergence with every God appointed time. Our Father in heaven Hallowed be Your Name EL ELYON God Most High Gen. 14:18-22 Thy Kingdom come. Thy will be done. On earth as it is in Heaven. Scripture: He who dwells in the shelter of the Most High Will remain secure and rest in the shadow of the Almighty. Thy Kingdom come. Thy will be done. On earth as it is in Heaven. In the UK teachers spend considerable amounts of learning time dealing with bullying, hate crime, and non-attendance arising from prejudice. Immigrants from France make over 153 attempts a day to get into Kent. We pray for the Home Office as they organise the Border Force to stop immigrants trying to get into Kent. We ask that adequate funding is made available for the Border Force to do their work. We pray for their French counterparts as they maintain border security and keep legitimate passengers and trade moving. Father God we invite You into this situation. We ask that Your Kingdom come and Your most perfect will be done in and through everyone concerned in Jesus Name we pray. Blessing: We bless all who are involved in schools to bask in that great and precious love of God that casts out fear. We bless them not to be afraid or anxious about anything. We bless them to cast their fears on Him, and to turn to the One who loves them more than they can imagine. Pray for a Divine watcher over each school. Pray for the ancillary staff, Governers, Caretakers, secretaries, cooks, cleaners, dinner ladies, lollipop ladies. Father God Your word declares that You will liberally supply our every need according to Your riches in glory in Christ Jesus [Phil. 4:19] so we ask that You will provide divine watchers over every school. Our Father in heaven Hallowed be Your Name MELEK KAMELECH King of Kings 1 Tim. 6:13 Thy Kingdom come. Thy will be done. On earth as it is in Heaven. Proclamation: We proclaim that Jesus is the King of Kings and Lord of lords and the LORD of all. Declaration: We declare that the wisdom of this world will be destroyed and God will frustrate the wise according to His word in Corinthians, because the foolishness of God is wiser than man’s wisdom. We declare there is a wisdom from above that is far beyond the wisdom of this world, and that the world will one day bow the knee to Him. Blessing: We bless the wise in our educational system to humble themselves before the mighty hand of God. We bless them to know their knowledge comes from the One whose ways are far greater and far higher than theirs. We bless them to know that truth is a person and that person is Jesus. We bless the places of education to be places of righteousness, peace and joy. We bless every student to reach their full potential. We bless these establishments to be places of safety and support. Pray for a renewal of personal confidence in the teachers and the teaching profession. Pray for the N.Q. T’s that they will be encouraged to stay in the profession. Pray for the teaching assistants. Proclamation: We proclaim that You are LORD and Master of all things. You are sovereign LORD. Declaration: We declare that the LORD is Master of all things, and all things are in His hands. We declare the earth is the LORD’S and the fullness thereof. Blessing: In Jesus’ Name we bless the negotiations between the Brexit team and the EU Team to come in line with the sovereignty of God and to acknowledge Him as LORD of all the earth. We bless the people of this nation to want to serve Him who is all goodness and love. We bless them with the understanding of the privilege of serving a good and faithful LORD who is always fair and always just. 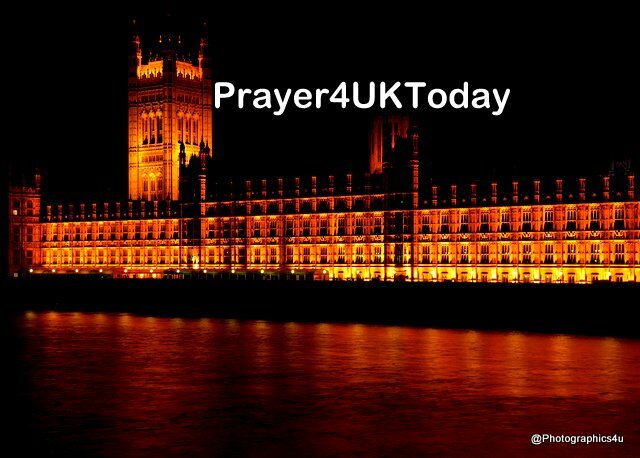 Prayer: LORD may the people of Britain know there is a God in heaven who loves them and wants the very best for them. May they know the privilege of serving You, that nothing compares with allowing You to be Master and LORD of their lives, and the security that brings. Pray for children starting secondary school. Father God we thank You that the entrance and unfolding of Your words give light; their unfolding gives understanding to the simple [Ps. 119:130] and You watch over Your word to perform it. [Jer. 1:12] We pray for Godly teachers who can instruct children to discern good from evil, recognising that the power of the spoken word has the ability to impact their lives for the rest of their days.